Translated from Russian by Marie Brodsky with assistance from Gina Yatsenko, Ray Droujkov, and Artem Astapchuk. Classical Euclidean geometry, with all its triangles, circles, and inscribed angles, remains an excellent playground for high-school mathematics students, even if it looks outdated from the professional mathematician's viewpoint. It provides an excellent choice of elegant and natural problems that can be used in a course based on problem solving. The book contains more than 750 (mostly) easy but nontrivial problems in all areas of plane geometry and solutions for most of them, as well as additional problems for self-study (some with hints). Each chapter also provides concise reminders of basic notions used in the chapter, so the book is almost self-contained (although a good textbook and competent teacher are always recommended). More than 450 figures illustrate the problems and their solutions. The book can be used by motivated high-school students, as well as their teachers and parents. After solving the problems in the book the student will have mastered the main notions and methods of plane geometry and, hopefully, will have had fun in the process. What a joy! 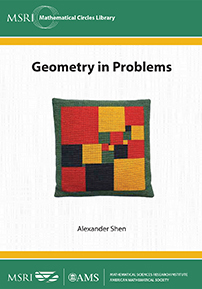 Shen's “Geometry in Problems” is a gift to the school teaching world. Beautifully organized by content topic, Shen has collated a vast collection of fresh, innovative, and highly classroom-relevant questions, problems, and challenges sure to enliven the minds and clever thinking of all those studying Euclidean geometry for the first time. This book is a spectacular resource for educators and students alike. Users will not only sharpen their mathematical understanding of specific topics but will also sharpen their problem-solving wits and come to truly own the mathematics explored. Also, Math Circle leaders can draw much inspiration for session ideas from the material presented in this book. We learn mathematics best by doing mathematics. The author of this book recognizes this principle. He invites the reader to participate in learning plane geometry through carefully chosen problems, with brief explanations leading to much activity. The problems in the book are sometimes deep and subtle: almost everyone can do some of them, and almost no one can do all. The reader comes away with a view of geometry refreshed by experience. Students, teachers, math circles organizers, parents, and others interested in teaching and learning basic plane geometry. Author Misc Blurb: Translated from Russian by Marie Brodsky with assistance from Gina Yatsenko, Ray Droujkov, and Artem Astapchuk.